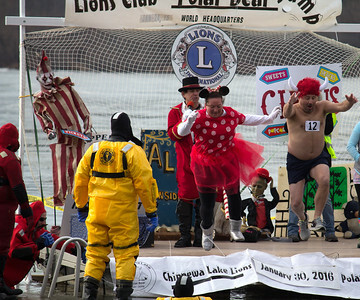 ALEC SMITH / GAZETTE Tiffany Kozel of Medina, dressed as Minnie Mouse, and Keith Bair of Columbus head for the cold water of Chippewa Lake on Saturday afternoon at a Lions Club fund-raising event. ALEC SMITH / GAZETTE A pajama-type look was the order of the day for Justine Fechko, Karnel Fechko, and Cindy Phillips, all from Medina, at the 2016 Chippewa Lake Lions Club Polar Bear Jump fund-raising event Saturday. 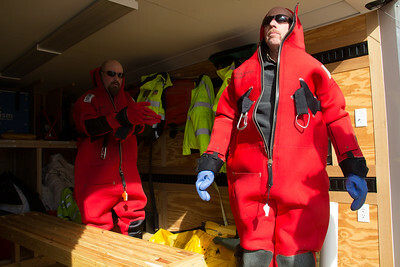 ALEC SMITH / GAZETTE Chatham Township Fire Department Lt. Mike Farren (left) and Chief Bill Disbrow get ready for duty if needed for safety reasons at Saturday's Chippewa Lake charity fund-raising event. 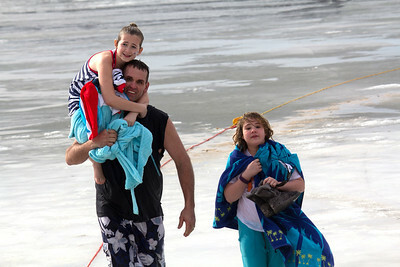 ALEC SMITH / GAZETTE Walking off the ice after Saturday's Polar Bear Jump at Chippewa Lake is Brad Winter, assistant fire chief of Medina, with Kailey O'Callaghan on his shoulder and Alyna Yagatich from Akron (right). AARON JOSEFCZYK / GAZETTE Tara Freeland and Leeann Paulovicz jump into the ice cold water during the Polar Bear Jump fund-raising event held by the Chippewa Lake Lions Club on Saturday. 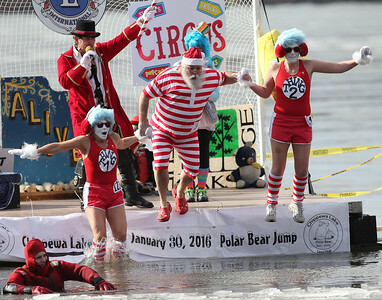 AARON JOSEFCZYK / GAZETTE Connie Willis, Santa Claus and Jessica Sanders leap into the water during the Polar Bear Jump in Chippewa Lake as master of ceremonies Eric Neiger looks on. Willis and Sanders were dressed as Thing 1 and Thing 2 of Dr. Seuss children's storybook fame. ALEC SMITH / GAZETTE As Jeane Kasper headed toward the jumping area for Saturday's fund-raising event at Chippewa Lake, she decided her shoes weren't needed for the moment. 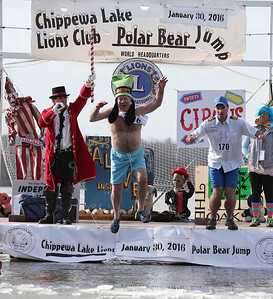 AARON JOSEFCZYK / GAZETTE Chippewa Lake Lions Club chief polar bear Al Robbins and Tim Herrle leap into the water during the Polar Bear Jump fund-raising event held Saturday as master of ceremonies Eric Neiger looks on. 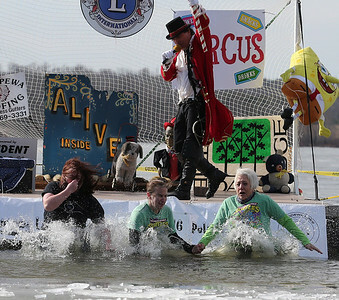 AARON JOSEFCZYK / GAZETTE Top money raisers for the SHC / The Arc of Medina County Bethanie Taylor, April Kulbacki and Laura Boreman leap into the water during the Polar Bear Jump in Chippewa Lake on Saturday. 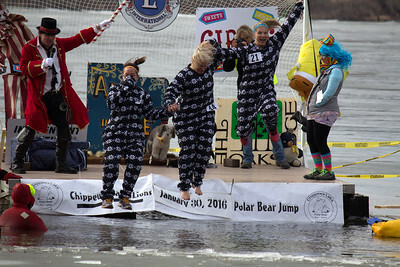 AARON JOSEFCZYK / GAZETTE Kelsey Lattimore and Jessica Vargo get ready for their jump into Chippewa Lake on Saturday at the 2016 Polar Bear Jump fund-raising event. 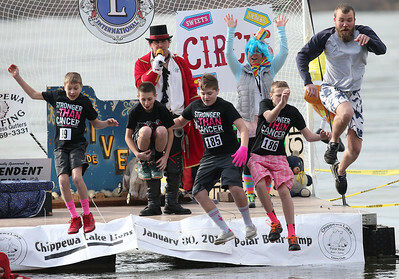 AARON JOSEFCZYK / GAZETTE Chippewa Lake residents (L-R) Colin Andel, Ashton Newton, Justin George, Brody Whitman and Ryan Andel leap into the ice cold water during the Polar Bear Jump on Saturday. The group said they were raising funds in support of Shanna Strong. 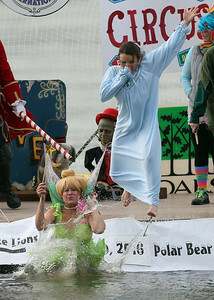 Top money raisers for the SHC / The Arc of Medina County Bethanie Taylor, April Kulbacki and Laura Boreman leap into the water during the Polar Bear Jump in Chippewa Lake on Saturday.